राष्ट्रीय झंडा तिरंगा A horizontal rectangular tricolor with equally sized deep saffron at the top, white in the middle and India green at the bottom. In the center is a navy blue wheel with twenty-four spokes, known as the Ashoka Chakra. The flag is based on the Swaraj flag designed by Pingali Venkayya. राष्ट्रीय निसान अशोक चिन्ह An adaptation of Lion Capital of Asoka at Sarnath was adopted as the National Emblem of India on 26 जनवरी 1950, the day India became a republic. Forming an integral part of the emblem is the motto inscribed below the abacus in Devanagari script: "Satyameva jayate" (English: Truth Alone Triumphs), a quote taken from Mundaka Upanishad, the concluding part of the sacred Hindu Vedas. राष्ट्रीय कलेंडर शक कलेंडर Saka calendar was introduced by the Calendar Committee in 1957, as part of the Indian Ephemeris and Nautical Almanac, which also contained other astronomical data, as well as timings and formula for preparing Hindu religious calendars. Usage officially started at 1 Chaitra 1879 Saka Era, or 22 मार्च 1957. राष्ट्र गान जन गण मन Jana Gana Mana by Rabindranath Tagore was officially adopted by the Constituent Assembly as the Indian national anthem on 24 जनवरी 1950. राष्ट्रीय गीत वंदे मातरम The first two verses of Vande Mataram by Bankim Chandra Chatterjee was adopted as the National song of India in 1950. "Vande Mataram" was sung during the 1896 session of the Indian National Congress by Rabindranath Tagore. Oath of allegiance National Pledge (India) It was Written in Telugu by Pydimarri Venkata Subba Rao in 1962. Central Advisory Board on Education directed that the pledge to be sung in Schools and that this practice to be introduced by 26 जनवरी 1965. राष्ट्रीय फूल कमल Lotus (Nelumbo nucifera) is a sacred flower and occupies a unique position in the art and mythology of ancient India and has been an auspicious symbol of Indian culture. 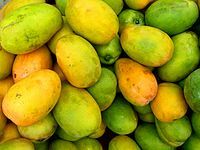 राष्ट्रीय फल आम Mango (Mangifera indica) originated in India and the country is home to more than 100 varieties of the fruit. राष्ट्रीय नदी गंगा Ganga is the longest river of India with the most heavily populated river basin in the world. The river is revered by Hindus as the most sacred river on earth. राष्ट्रीय पेड़ बरगद Indian banyan (Ficus bengalensis) root themselves to form new trees and grow over large areas. Because of this characteristic and its longevity, this tree is considered immortal and is an integral part of the myths and legends of India. राष्ट्रीय पशु बाघ Bengal tiger (Panthera tigris tigris), the largest carnivore is found only in the Indian subcontinent and can be found in most regions of the country. राष्ट्रीय पनिहा जानवर गंगा सूँस Gangetic Dolphin (Platanista gangetica) is said to represent the purity of the holy Ganga River as it can only survive in pure and fresh water. राष्ट्रीय चिरई मोर Indian peacock (Pavo cristatus) is designated as the national bird of India. A bird indigenous to the subcontinent, peacock represents the unity of vivid colors and finds references in Indian culture. राष्ट्रीय करेंसी भारतीय रूपया Indian Rupee (ISO code: INR) is the official currency of the Republic of India. The issuance of the currency is controlled by the Reserve Bank of India. The Indian rupee symbol is derived from the Devanagari consonant "र" (ra) and the Latin letter "R" was adopted in 2010. ↑ 1.0 1.1 "National Flag". Government of India. पहुँचतिथी 3 मार्च 2014. ↑ "National Identity Elements of India". knowindia.gov.in. पहुँचतिथी 1 जनवरी 2014. ↑ "State Emblem". भारत सरकार. पहुँचतिथी 3 अप्रैल 2012. ↑ "National Calendar". भारत सरकार. पहुँचतिथी 3 अप्रैल 2012. ↑ "National Anthem". भारत सरकार. पहुँचतिथी 3 अप्रैल 2012. ↑ "National Song". भारत सरकार. पहुँचतिथी 3 अप्रैल 2012. ↑ Biswas, Arabinda; Agrawal, S. P. (1 जनवरी 1986). Development of education in India: a historical survey of educational documents before and after independence. Concept Publishing Company. प. 140. ISBN 978-81-7022-066-4. पहुँचतिथी 27 जनवरी 2012. ↑ "National Flower". भारत सरकार. पहुँचतिथी 3 अप्रैल 2012. ↑ "National Fruit". भारत सरकार. पहुँचतिथी 3 अप्रैल 2012. ↑ "National River". भारत सरकार. पहुँचतिथी 3 अप्रैल 2012. ↑ "National Tree". भारत सरकार. पहुँचतिथी 3 अप्रैल 2012. ↑ "National Animal". भारत सरकार. पहुँचतिथी 3 अप्रैल 2012. ↑ "National Aquatic Animal". भारत सरकार. पहुँचतिथी 3 अप्रैल 2012. ↑ "National Bird". भारत सरकार. पहुँचतिथी 3 अप्रैल 2012. ↑ "Currency Symbol". भारत सरकार. पहुँचतिथी 12 नवंबर 2012.